As always, click on the links below the small photos to see bigger versions. My oldest son decided to come visit from another state for a couple of weeks. He's owned a couple of motorcycles, both dual sports, and likes to ride on dirt roads and trails. My original plan was to take him out on some easy dirt roads nearby on a Saturday morning, then go do a more serious ride on a weekday the next week. My younger son, who lives relatively close, has Mondays and Tuesdays off, so it seemed like a good thing for the three of us to do. When we originally planned all of this, I only had two bikes. My younger sone was going to borrow one from a friend if I could get it running properly, but that turned out to be more difficult than expected. I finally decided to just buy another bike if I could find a good deal on one, so that's what I did. 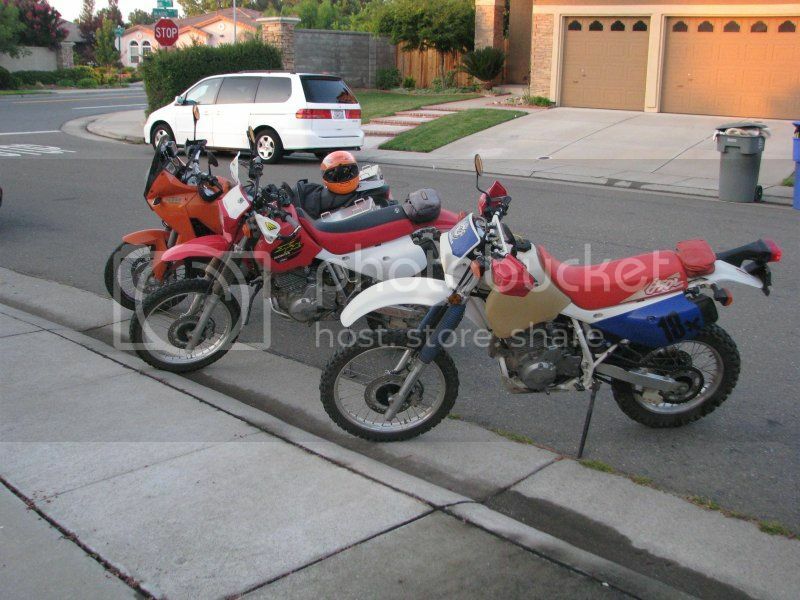 I now own two XR650L's. Plans tend to change, with neither of my sons being able to go riding on Saturday, so I took a Tuesday off and decided to do one big ride then. The plan was to head to Nevada City, which is about 50 miles north of here, then take some back roads - some dirt, some paved - through to Downieville. 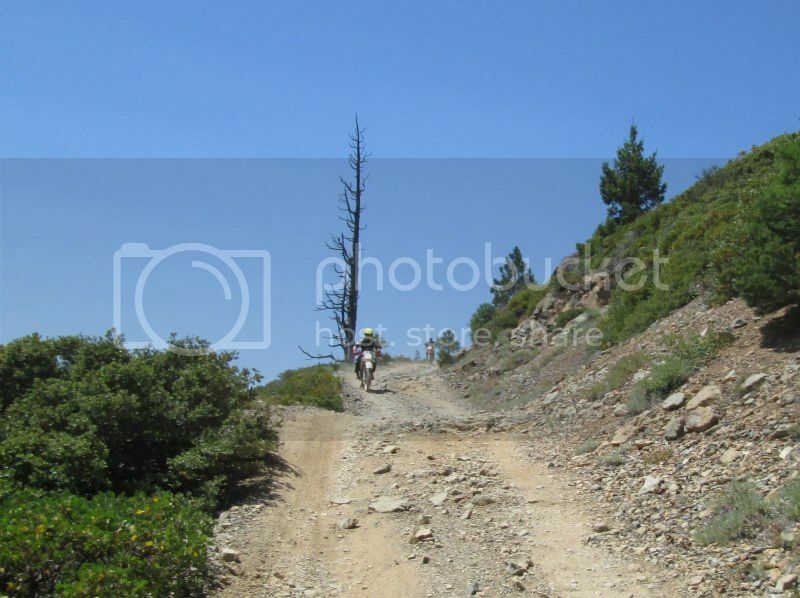 From there we would ride up the dirt roads to the top of Sierra Buttes with the goal of getting to the lookout tower at the top. I had attempted to get up there once before, but was riding alone with worn tires and chickened out a couple of miles from the top. I was afraid of getting stuck and not being able to get my nearly 500 pound KTM turned around by myself. With new dirt-oriented tires on the KTM, even better dirt tires on the new-to-me Honda, and decent dual sport tires on the other Honda, I figured we should be able to ride to the top without too much difficulty. The plan was to get started somewhere near 6:30 a.m. I was up and ready by then, my older son was up and ready, but my younger son was a little slower to get going. After fiddling around and remembering various things we had forgotten, it was 7:10 when we finally headed off. Like the last time I rode up that way, I took the easy roads out of town up to Auburn, then a few side roads to head east a little bit to Placer Hills Road and Dog Bar Road so that we could skip the one boring section of Highway 49 between Auburn and Grass Valley. The temperature was a bit cold at first, turning into just about perfect for most of the ride. My older son brought his own helmet, which is a blue, black, and silver HJC. My younger son brought along a couple of motocross helmets, then decided to wear one of mine instead, so he grabbed the fluorescent yellow AFX dual sport helmet. Watching them in my mirrors to make sure they were safely back there, I was struck by how much better the yellow helmet showed up than the multi-colored blue one. The only thing that stood out from the front was the headlight with the darker helmet, but with the yellow one, both the headlight and the helmet showed up and I noticed the helmet more than the headlight. I'm going to stick with bright helmets in the future. I wanted to top off the fuel tanks before heading toward Downieville so that the tanks wouldn't be so full (and heavy) for riding up into the hills, but we would still have enough fuel that there would be no concern about running out. I had been using my Garmin Zumo 550 GPS with a bunch of shorter segments for this ride. It did great getting us to Nevada City. I loaded in the map from Nevada City to Downieville. That turned out to be what helped us get lost four times before we made it to Downieville. I had set the GPS to find the beginning of the route at a turnoff from Highway 49. Just getting out of the gas station it ran us through a bunch of back roads before we finally got onto Highway 49, then it didn't indicate anything at the start of Bloomfield Road where I wanted to start. So I reset it and started heading up the road. It was more paved than I expected, then pretty soon we were coming out onto Highway 20, which is a major road and not what I wanted to ride on. So I reset the GPS, headed back the way we came, and started again. The next time, the GPS wound us around a few other dirt roads, then pretty soon we were heading for Highway 49 further west. Time to turn around again. I finally gave up on using the GPS route after I figured out that I had the one for the reverse direction in there and the starting point was practically in Downieville with the GPS wanting to take major roads to get there. Then I had the bright idea to try the other route coming back in case I got the two mixed up. but that wasn't any better. Finally we asked somebody which roads to take, found the only open bridge across the South Yuba River, then I just set the GPS to find Downieville, which it can still do reasonably well. I later found out that both of the routes that I had loaded into the GPS were the north to south version. Oops! 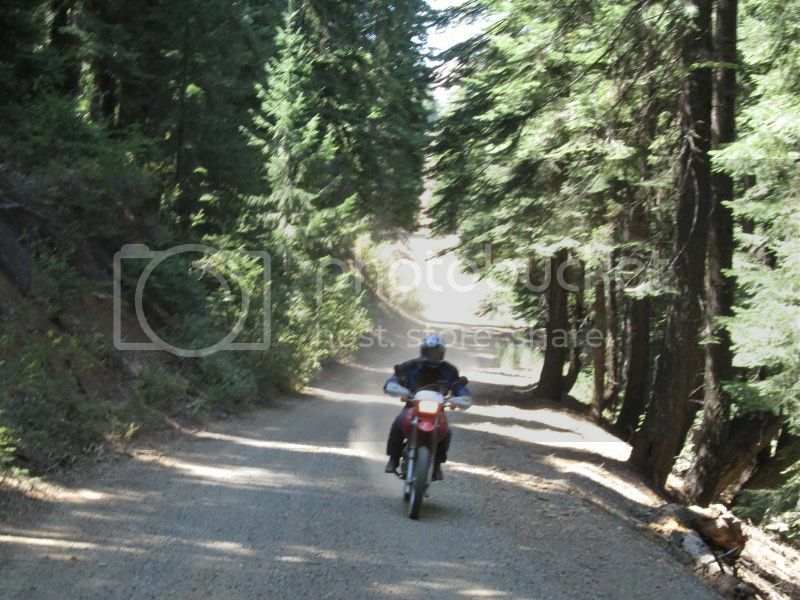 Once at Downieville, I knew exactly where I wanted to go. We stopped there for a bit to rest our backsides, clean face shields, drink some water, and walk around a bit. 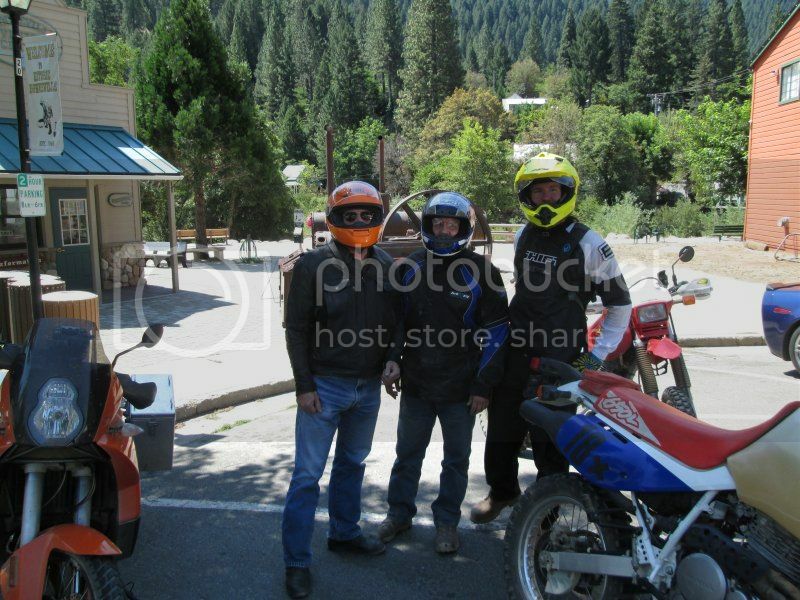 This is our small group in Downieville. I like that little town. I set up my GPS for the next route up the mountain and we headed east 5.5 miles on the wonderful smooth curvy road to the start of the dirt road, then up the dirt road all the way to the top. After a few miles, my younger son decided we were going too slow and blasted on past. We didn't see him again until the top. He's done a lot of dirt riding, so that was okay, although I had hoped to get a few more photos of all three of us on the way up. Oh well. This is my older son "posing" for an action shot. I let my younger son lead until the steep part started, then recommended that he let me go first and my older son second in case either of us needed help heading up the hill. It was much easier going up the hill this time with the new Heidenau K60 Scout tires on my KTM than the last time with the very worn Continental Trail Attacks on it. 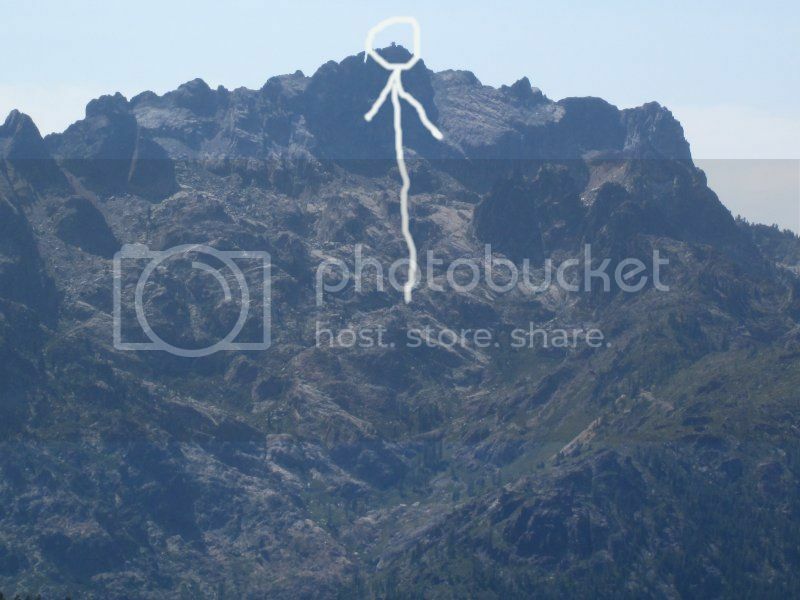 I didn't even hesitate at the spot where I had chickened out the previous time up there. The road was rough and dusty with a lot of rocks on it, so it was challenging, but not seriously difficult. The edges of the road are usually smoother, but when riding there I was often concerned about smacking a tree with one of my mirrors or scraping a big rock with one of the aluminum side cases on the back. The KTM does best on trails like that at 15-20 mph. You need some momentum heading up hills to better deal with loose dirt and rocks. I occasionally waited until I could see the other two behind me when I got to flatter areas, but made sure that I moved on before either of them would need to stop because of me. I didn't want them losing momentum. The view up there was spectacular, when I could steal a glance at the scenery, because I didn't want to miss seeing some big rock in the road and end up riding over it rather than steering around it. Steering a big adventure bike on rough dirt roads involves "suggestions" rather than precise steering inputs. I imagine that would be hard to get used to for someone who has only ridden on paved roads. I recognized the road for a while, then knew that I had made it past the previous stopping point when things started looking new to me. I kept my momentum past the car parking area and on up the road until I came to a gate across it indicating that only authorized vehicles could go past that point. I had made it to the top of the road. I parked the bike there until my two sons pulled up behind me a few seconds later. I had achieved one of my goals to ride to the top of Sierra Buttes. The road, the gate, and the parking area at about 8200 feet altitude. It was somewhere around half a mile to the top, all uphill and at way higher altitudes than I'm used to. The top is at 8587 feet). Even though I exercise regularly, usually riding a bicycle, hiking up a steep road at altitude quickly makes me feel very out of shape. But I trudged on up the hill to the very top, because I just had to get up there. My younger son had brought quite a few people up to that spot when he worked at a resort in Tahoe. He warned me that if I was afraid of heights, I might have a problem getting to the lookout station. I assured him that I had no fear whatsoever of heights. Once at the very end of the road there are some rather steep stairs up the rocks to the top. These are some of the steepest stairs I've ever been on. There were a lot of hikers up there, some of which where apparently afraid of heights. Not me, though. 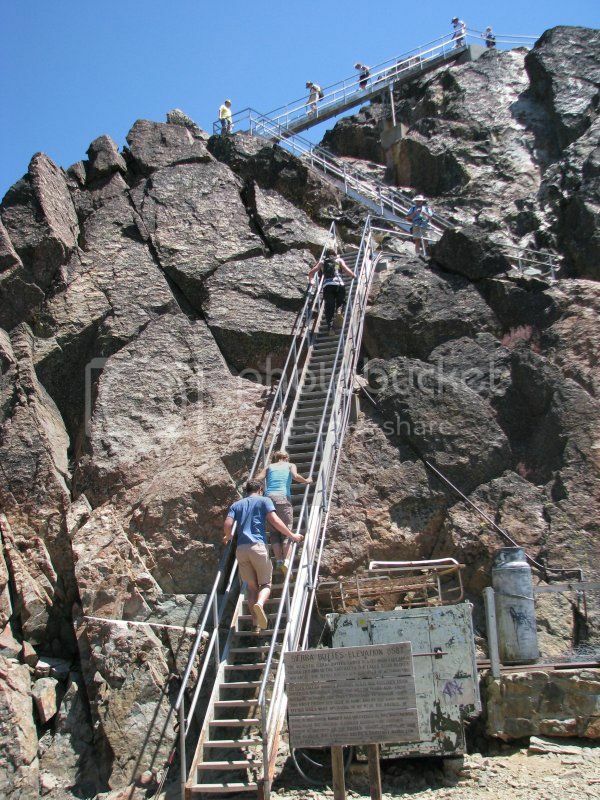 It was much easier climbing the stairs because I could use the hand rails and my arms to do half of the climbing work. I still needed to rest a little at each flat area between the different stair sections. It was quite windy going up, and rather cold. I was almost wishing that I hadn't left my leather jacket back with the bikes. The other thing that I noticed once at the top is that there are some very agressive flies up there. I don't know how they survive on the top of a mountain, but they were quite annoying. The structure at the top was designed for people looking for forest fires and they have an unobstructed view in all directions for many miles. I suppose they slept inside or something, but there was a railing and walkway all the way around the outside. It was a long drop on the east side - almost enough for base jumping. 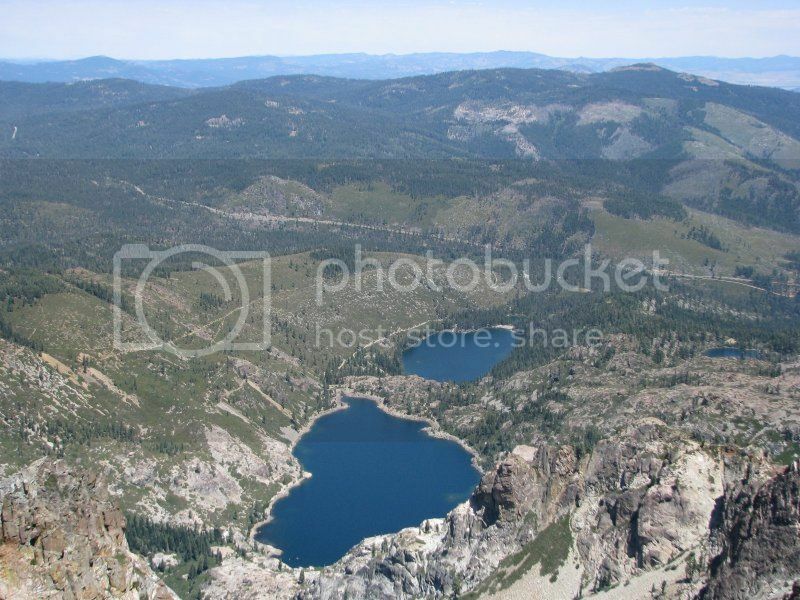 Here you can see Upper Sardine Lake closest to us, and Lower Sardine Lake further out. I had to resist the temptation to take panorama shots all the way around. They're usually not all that interesting to look at later on, so I only took about half a dozen shots of the scenery at the top. As evidence that even kids in their late 20's and 30's never quite grow up, the boys went down a little ways and grabbed a few big rocks to throw off the side. It took about five seconds for them to hit. The one big one that weighed about five pounds made a rather loud noise when it hit and shattered into pieces. I was waiting to hear "Hey up there, stop throwing rocks". The younger son who lives in Truckee says that next time he goes back there he's hauling up some even bigger rocks to toss off. It wasn't until heading back down the road to the bikes that it became obvious to me that my riding boots aren't very good hiking boots. I didn't end up with any blisters or anything, but my younger son, who had borrowed some of my other boots, did. But he thinks he's tough, so no big deal. Heading back down was all first gear, try to let the engine do as much braking work as possible, and release the front brake over any loose stuff. I was first heading back down as well. At one point I caught up with an SUV that was going way too slow down the hill. I couldn't go that slow down the steep parts and maintain proper control, but they pulled off soon enough when they got to a wide spot in the road and let us all by. We had been talking to them up at the top, and everyone was totally friendly to us. Once down from the steep part of the road, we turned south onto a road that I had never been on before. I think most of it was Butcher Ranch Road, and then a bit of Sierra Buttes Road. It came out right in the middle of Sierra City, population under 300 people. The road down was a mix of medium size rocks, dirt, and gravel, with fairly a steep drop off to the south. You don't want to get going too fast on a road like that. I got a little bit ahead and was able to stop, get the small camera out of my pocket and actually get an action shot of the other two coming behind me. Then they went past and I got to eat their dust for most of the rest of the way down. We got into Sierra City at about 1:30 and were all hungry. The only choice there was a deli, which happened to have very good sandwiches. We spent about 45 minutes there and figured out the route back. Rather than going on the road I had planned, we decided to try some dirt roads a bit further east that went further before getting back to paved roads. Somebody in Sierra City told us about a shortcut to the road, and I let my son lead, since he's spent so much time in the area looking for good fishing spots and places to dig gold out of the rivers. One of the roads we took first was quite interesting. It had major sections that had worn through to the dirt and turned into big potholes. Not a problem if you spot them all, but they'll bounce you pretty good if you miss one in a shadow and go through it. There were also a lot of rocks two to three inches across on the edges and center of the road where four-wheel vehicles don't knock them out of the way. I stopped at one point to get this shot of Sierra Buttes from a distance. As seemed to be our custom on this ride, when we got to a fork in the road, we picked the one that looked most interesting, causing us to backtrack a few times. One road looked good for several miles, then started getting more narrow with humps to help keep erosion down. Then we started brushing bushes growing into the road, then pretty soon it was narrow enough that you would be brushing both sides. It looked like a great spot to turn around, but my younger son wanted to see if just maybe it went through to a bigger road and went down there a mile or two further. My GPS showed it continuing on. It just got worse. 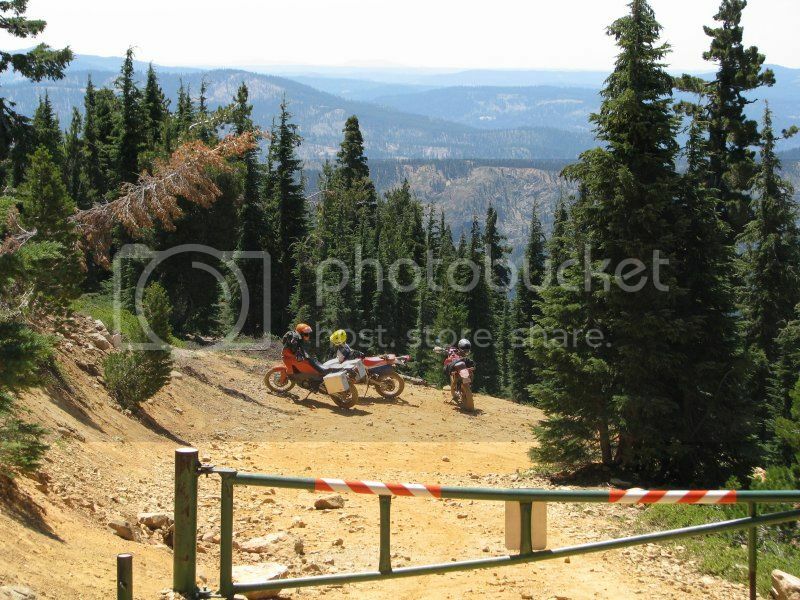 I'm glad I didn't take the big KTM down there and have to get it turned around on a narrow road. On the bigger dirt roads in this area, we were able to maintain speeds of around 40 mph. One trick to learn is dealing with the dust if you're not the first rider. The second rider can stay fairly close to the first one and off to one side and avoid about 80% of the dust. The third rider has to just hang way back and hope that the dust settles quickly or blows off to the side. The only real issue with dust is that it collects on the helmet face shield and starts blocking the view, especially when heading into the sun. And you don't want the shield partially open or it will get on the inside where it is harder to wipe off. I'm thinking that it would be nice to have a strip of terrycloth on the back of one glove to make dust removal easier. Leather doesn't quite work good enough at removing dust. We tried a few other roads until we eventually came to a paved road. Then we just needed to decide to find the nearest gas or take the road that went in the direction of Folsom. I started to get nervous about fuel, so we headed east to Highway 89 and went on into Truckee. We filled up all of the bikes there, and since my younger son lives there, we stopped by his place to get something to eat and drink. I had never seen where he lives, so that was an okay stop. The only issue now was the best way back to Folsom. My younger son doesn't actually have a motorcycle license currently, just a permit which is good for six months. He's probably had at least 8 permits, but has never managed to actually get the official license. The only difference with a permit in California is that you can't ride with a passenger, can't ride at night, and can't ride on freeways. We were in danger of breaking two of those three restrictions before getting back to my house in Folsom. I've told him that he can take on of my Hondas for a couple of weeks if he'll promise to take the riding test and become totally legal within a week. He should be good by September. We took frontage roads along the side of the freeway, but eventually those ended and we hopped onto I-80. I saw something on that trip that I have NEVER seen on that road before - it was totally empty in our direction for nearly ten miles. Nobody in front of us and nobody behind us. I was leading and trying to keep it as close to the 65 mph speed limit as possible. Not because I have anything against exceeding the speed limit, but to make it a bit easier on the two with no wind protection. We probably road nearly 50 miles on the freeway before getting off in Auburn. We stopped for food, then took back roads the rest of the way home. The sun hadn't quite set when we made it home. The ride was a bit over 12 hours, and somewhere around 290 miles. My backside wasn't quite as sore as those who rode the Hondas, plus I'm more used to riding long distances. Overall it was a successful trip which we all enjoyed. I've even cleaned up one of the three dust-covered bikes and hope to get to the other two before the weekend. Awesome way to spend family time! As usual an excellent trip report. Thank you. In the photo of the 3 of you, was your son (yellow helmet) standing on something or is he really that tall? Looked as if he might be on a small rock but if he wasn't, what did you feed him as a child,,, the neighbors? He's almost the exact same size as me, including weight, except that his weight is up higher than mine. We were standing on an incline with me at the lowest point, and I think he was on his toes to look taller. My older and shorter brother does that for photos as well.